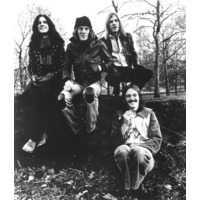 Humble Pie was a rock band from England, finding success both in the UK and the US. They are remembered for songs such as "30 Days in the Hole", "I Don't Need No Doctor", and "Natural Born Bugie". The original band lineup featured Steve Marriott from Small Faces, vocalist and guitarist Peter Frampton from The Herd, Greg Ridley former bassist from Spooky Tooth and seventeen-year-old drummer Jerry Shirley.